If you contacted us and would like a paper QSL, please send a business sized self-addressed stamped envelope (SASE) to this address. Please include your QSL card, if you have one. We mailed our QSL card for this special event in September 2015. The http://hubblesite.org/ wesbite lets you explore the astronomy. 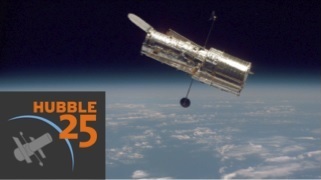 You can vote here: http://hubble25th.org/education/23. 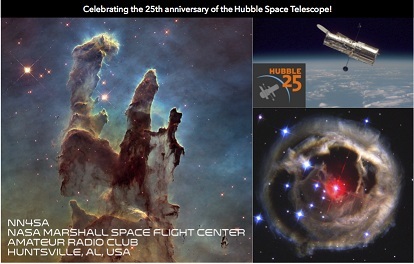 It’s a tribute to the hard work, ingenuity and imagination of so many in our NASA Family that this week we’re able to mark the 25th anniversary of the Hubble Space Telescope. For a quarter century and counting, Hubble has cast the collective eye of humanity on the previously unknown and unimagined. At once a scientific marvel and gallery of wonder, it continues to teach us about the vastness and beauty of the universe. It looks both inside our solar system and into the great beyond, including far off galaxies and distant stars. Having made more than a million observations since its mission began in 1990, Hubble has rewritten the astrophysics and planetary science textbooks. Astronomers have published upwards of 12,700 scientific papers based on information it produces. Each and every year, it generates 10 terabytes of new data and discovery – enough data to fill the entire collection of the Library of Congress. At the same time, Hubble continues to provide us with the intellectual foundation for future robotic and human expeditions – including our Journey to Mars. As Traci Watson wrote in USA Today’s recent special edition: “It’s likely that no other modern-day scientific instrument has stirred as many passions as the Hubble Space Telescope … Before Hubble few of us had any notion of how the cosmos looked. On a personal note, I’m proud to have been a part of such a fine crew that launched Hubble in 1990, along with Loren Shriver, Dr. Steve Hawley, Dr. Kathy Sullivan and Bruce McCandless. I’m also immensely proud to work with all of you. Thanks for all you are doing to reach new heights and reveal the unknown.